Imagine working for Bruce Wayne. How would that be? Now forget all of that and imagine working for Bruce Wayne’s cousin. 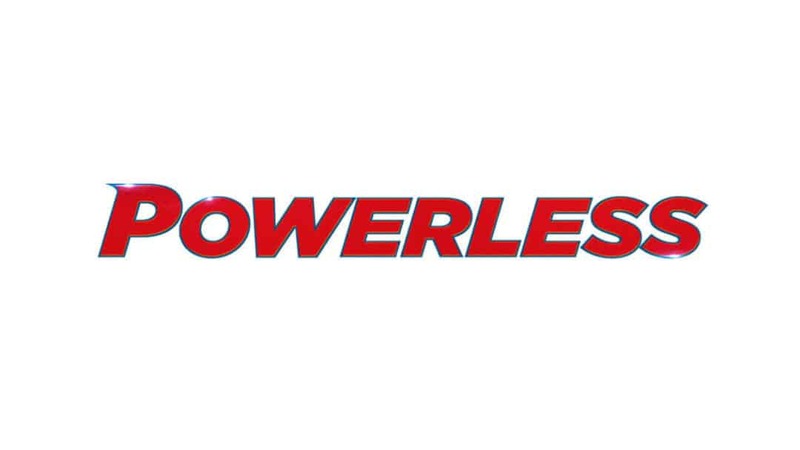 That is the idea behind the new show at NBC, Powerless. 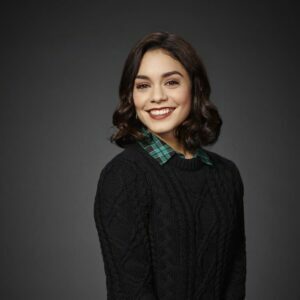 Starring Vanessa Hudgens, Danny Pudi, Ron Funches, and Alan Tudyk, the series takes place in the DC Universe. 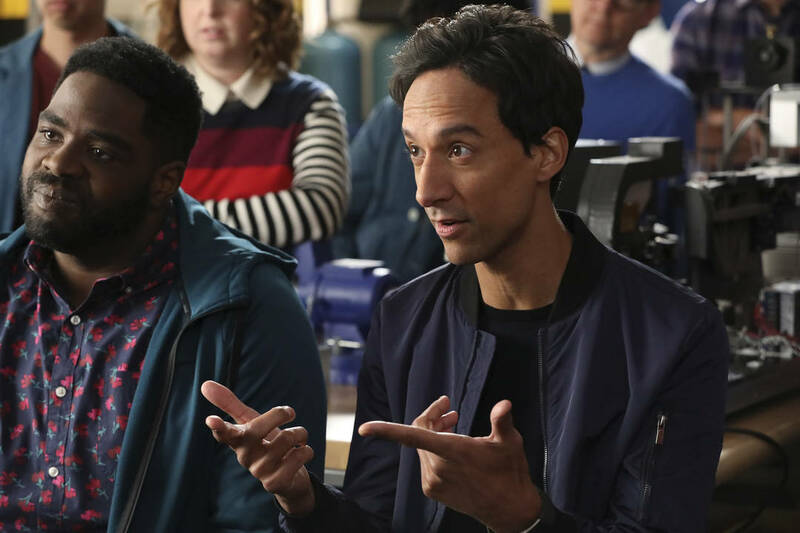 Powerless is like fresh air compared to what we have on television now as far as comic book shows are concerned and even comedies. I don’t think you have to be a fan of comic books to enjoy this. The same goes with Big Bang Theory. 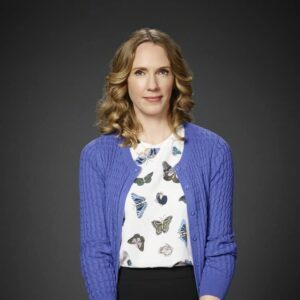 If you are a fan of comedies, workplace shows, or a non-traditional rom-com, this will be for you. Emily Locke (Hudgens) takes a brand new job with Wayne Security. On her way to work, she seems all kinds of accidents caused by villains and heroes, which she isn’t used to at all, but no one around her even bats an eye because they are used to it. She states she comes from a town that is a “fly-over city” because superheroes never stop, they just fly over. She meets all her new co-workers, who make safety products for Bruce Wayne. 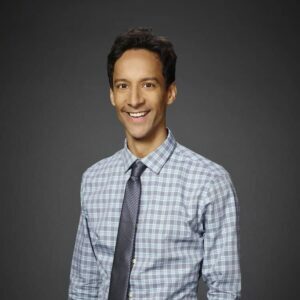 I hate to say this, but Daniel Pudi’s character Teddy seems a bit like the character he played on Community. In fact, he was the second reason I decided to watch this show, the first because it’s in the DC Universe. Now trying to be spoiler free as possible, I have to say that the opening credits are beautiful and my favorite part of the show thus far. I watched it three times just to see the beauty of these decades-old comics. The old style with 2017 technology looks incredible. 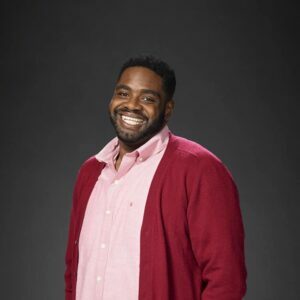 Ron Funches’ character (also named Ron) is one exception to the people living this town, as he still seems to get excited over all the superhero action that seems to fly by his work on a daily basis. 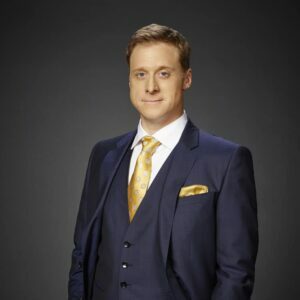 Alan Tudyk, who plays Bruce’s cousin Van, really delivers the laughs. This surprised me because everything I’ve seen him in previous, has not been a comical role. You can check his other works out in Serenity, Dollhouse, and A Knight’s Tale and even Rogue One (K-2SO). You get all kinds of DC Universe mentions in the series. I’m sure this will be their bread and butter even if they don’t appear on screen. 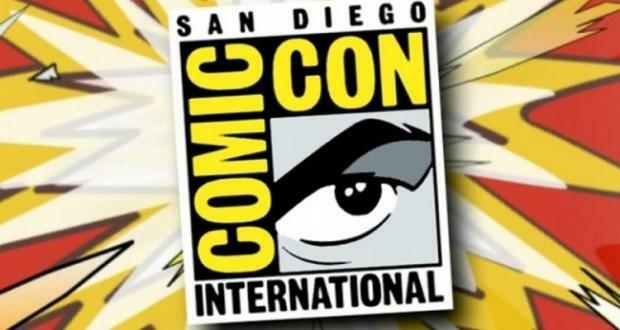 You also get to see a lot of inventions that Wayne Security makes for the average everyday human like myself or you, that is unless you have super powers and aren’t telling anyone. 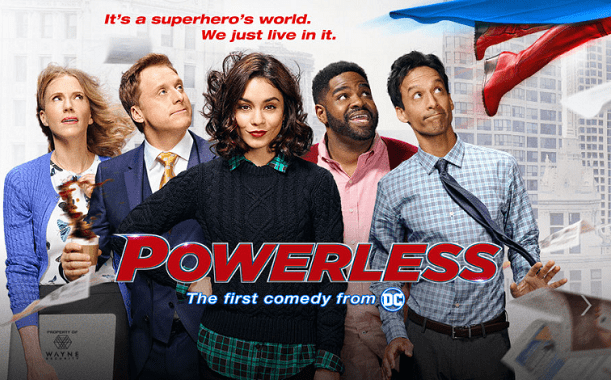 Powerless is better off investing its energies into its people, and dynamics between them if they want this to be a hit. 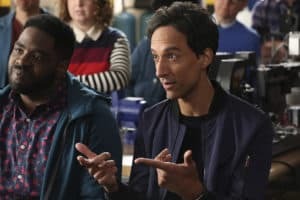 At one point, Van Wayne refers to a product that’s been put “in beta, wherever that is.” That’s exactly where this show is, too: in beta, but maybe almost ready to launch. I’ll keep watching. 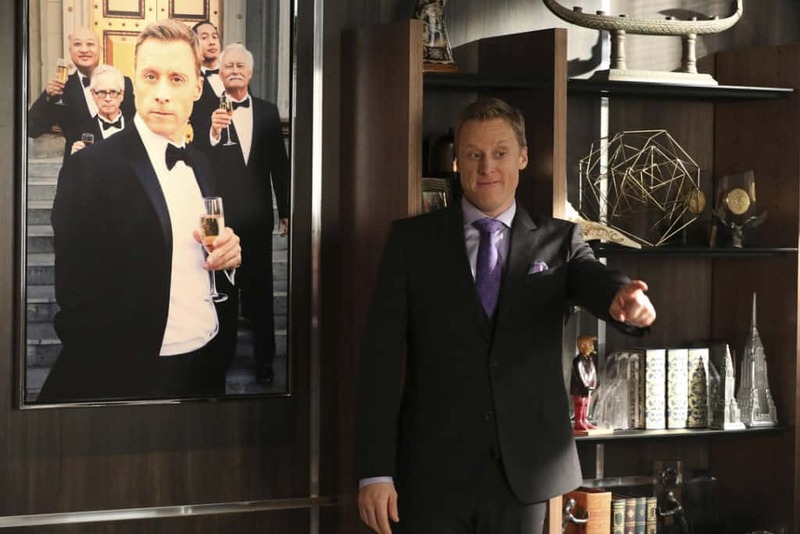 You can catch Powerless on NBC on Thursday nights at 8:30 pm ET/PT following Superstore. Van is on a mission to be included in the Wayne Dream Team photo. 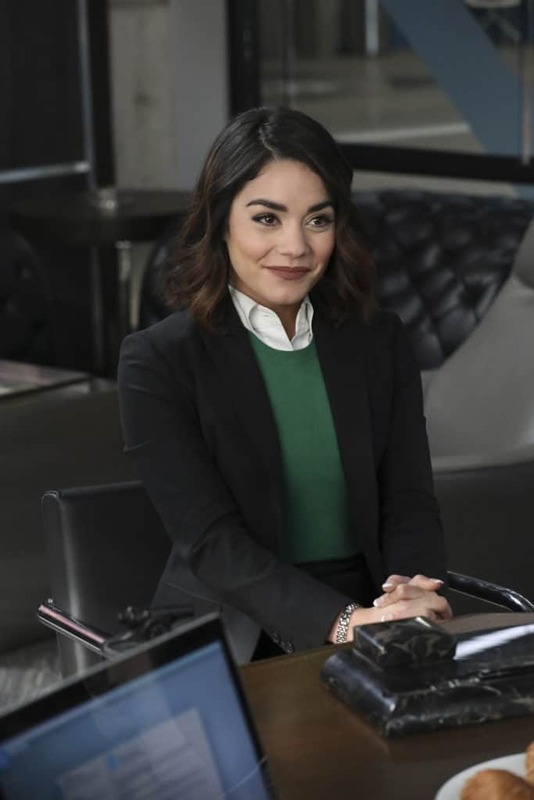 ABOUT POWERLESS- In the first comedy series set in the DC universe, Vanessa Hudgens (“Grease Live,” “High School Musical”) plays Emily, a spunky, young insurance adjuster specializing in regular-people coverage against damage caused by the crime-fighting superheroes. It’s when she stands up to one of these larger-than-life figures (after an epic battle messes with her commute) that she accidentally becomes a cult “hero” in her own right… even if it’s just to her group of lovably quirky co-workers. 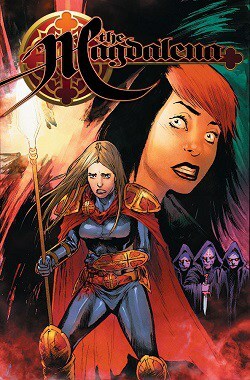 Now, while she navigates her normal, everyday life against an explosive backdrop, Emily might just discover that being a hero doesn’t always require superpowers. Ben Queen (“A to Z,” “Cars 2”) serves as writer and executive producer. Director Michael Patrick Jann (pilot, “A to Z,” “Children’s Hospital,” “Reno 911!”) also executive produces. “Powerless” is produced by Warner Bros. Television and based on the characters from DC. NEW “Teenage Mutant Ninja Turtles: Out of the Shadows” Trailer Released and It’s the Best One Yet! 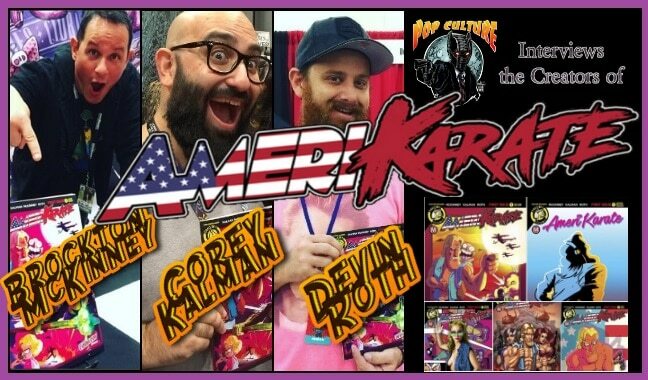 April 11, 2016 Jason Bennett Movie Trailer, Pop Cult News Comments Off on NEW “Teenage Mutant Ninja Turtles: Out of the Shadows” Trailer Released and It’s the Best One Yet!